> claim, please contact our director of finance. > telephone number to help locate your file easily. 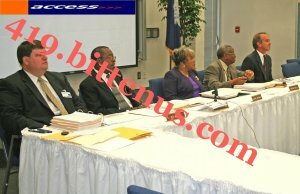 > program by non-participants or unofficial personnel. 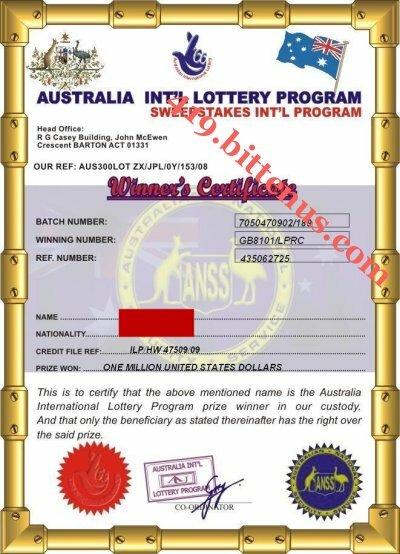 > Australian Lottery International (co-ordinator). > to you through the contact Address you will provide. > provide your full account details. > won will get to you. > YOU DISCUSSED WITH THE BANK FOR REFERENCE IN YOUR FILE. ISLAND LAGOS NIGERIA RC 125384. 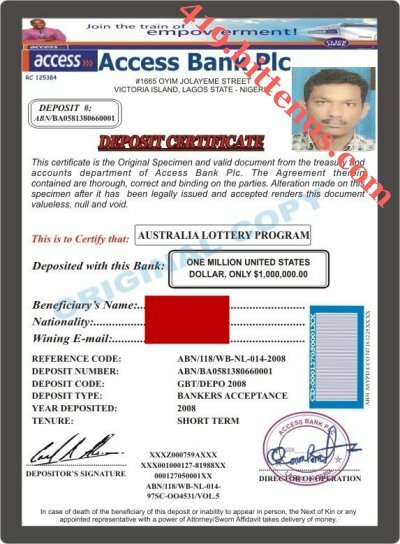 THIS IS TO INFORM YOU THAT WE HAVE ACKNOWLEDGED YOUR APPLICATION REGARDS TO THE TRANSFER OF THE MONEY THAT YOU WON FROM THE 2008 AUSTRALIAN INTERNATIONAL LOTTERY PROGRAM WHICH IS PRESENTLY DEPOSITED IN OUR BANK.THERE ARE TWO OPTIONS OPEN TO YOU. (2) INTERNATIONAL CERTIFIED BANK DRAFT. 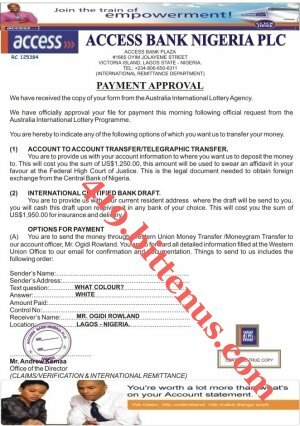 ATTACHED HEREWITH IS THE PAYMENT APPROVAL FORM WHICH YOU HAVE TO CHOOSE ONE OF THE TWO OPTIONS FOR TRANSFER AND MAKE THE IMMEDIATE PAYMENT THROUGH WESTERN UNION/MONEY GRAM TO OUR ACCOUNT AGENT, MR.OGIDI ROWLAND WHOSE PASSPORT PHOTOGRAPH IS ALSO ATTACHED HEREWITH. YOU ARE TO PROVIDE US WITH YOUR FULL NAME AND ADDRESS IF DIFFERENT FROM THE PREVIOUS ONE YOU PROVIDED. BECAUSE WE HAVE TO PARCEL IT THROUGH COURIER SERVICE, YOU ARE REQUIRED TO PAY THE COST OF US$1,950.00 (ONE THOUSAND NINE HUNDRED AND FIFTY UNITED STATES DOLLARS) THIS MONEY WILL BE USE FOR INSURANCE AND SAFE DELIVERY. NOTE THAT YOUR PRIZE HAS BEEN DEPOSITED INTO A TEMPORARY DOMICILIARY ACCOUNT WHICH MAKES IT PRACTICALLY IMPOSSIBLE FOR THE BANK TO DEDUCT OR FRAGMENT ANY AMOUNT OUT OF YOUR FUND DEPOSITED BEFORE IT WILL BE REMITT TO YOU. THIS MEANS THAT THE ABOVE CHARGES CANNOT BE DEDUCTED FROM THE PRIZE AND HENCE MUST BE PROVIDE BY YOU BEFORE YOUR PRIZE IS TRANSFERRED TO YOU. REMEMBER TO SEND A COPY OF THE WESTERN UNION OR MONEY GRAM PAYMENT SLIP TO THIS SAME E-MAIL AS AN ATTACHED FILE IMMEDIATELY AFTER THE PAYMENT IS MADE, FOR CONFIRMATION AND DOCUMENTATION. NOTE THAT ACCESS INTERNATIONAL BANK NEEDS TO TRANSFER YOUR WINNING PRIZE TO YOU IMMEDIATELY, SO REGARDS TO THAT YOU HAVE TO ABIDE BY OUR TERMS AND CONDITIONS AND MAKE THE PAYMENT AS INSTRUCTED. > proceed with the transfer of your money.